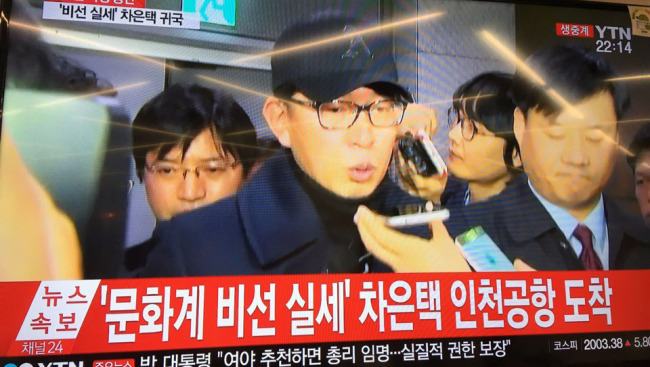 Prosecutors arrested Cha Eun-taek at Incheon International Airport late Tuesday for questioning over the influence-peddling scandal surrounding Choi Soon-sil, a close confidante of President Park Geun-hye. Cha was returning from China as prosecutors have been widening their probe into his role in the Choi scandal. 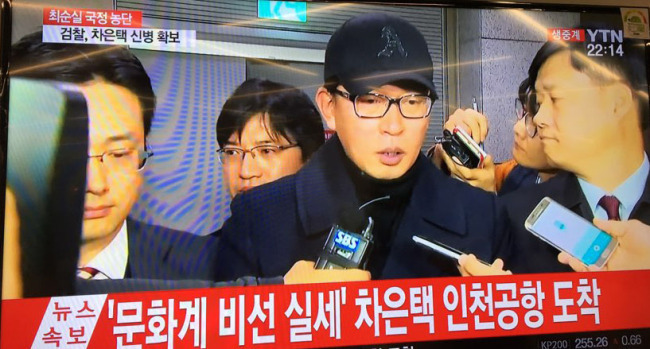 He was transported to the prosecutor’s office in Seoul for questioning. Cha, who has close ties with Choi, allegedly meddled in state-led projects and exerted undue influence in the culture sector. Cha has been called the “crown prince” in the local cultural scene, with the backing of the president’s friend Choi. Cha’s professor and uncle were appointed culture minister and senior presidential secretary for culture and education, respectively. The on-the-spot arrest of Cha came as investigators stepped up their inquiry into allegations that Choi’s associates, including Cha, interfered with various cultural projects for their personal gain. One of Cha’s close associates is Song Sung-gak, the former chief of the state-run Korea Creative Content Agency. Song was arrested late Monday night on suspicion he pressured a medium-sized ad company to hand over its shares to a third party.